Cutting costs: Despite a recession in the early 1990s, White Sox owner Jerry Reinsdorf pushed ahead with building a new Comiskey Park for his team. The move put Reinsdorf in a serious amount of debt, leaving him with but one choice: cut back on spending during the 1990 season. Some moves were never publicized, such as letting Boy Scouts rent out Old Comiskey's rat-infested locker rooms for camping trips and refusing to pay Ozzie Guillen because he couldn't speak English. Others, however, were painfully obvious. 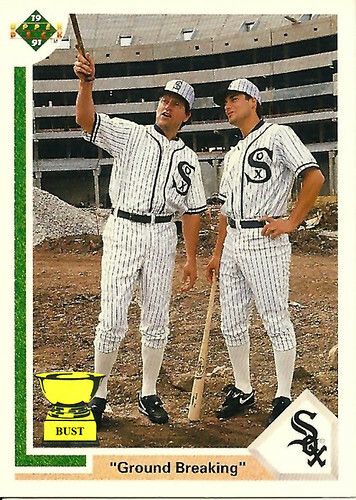 Here, we see two White Sox players dressed in authentic 1920s uniforms — because Reinsdorf refused to pay for new ones. Robin Ventura, right, is wearing one of Moe Berg's old unis; Carlton Fisk, age 93, is wearing his actual uniform from the 1929 season. Reinsdorf, however, managed to spin the move as "throwback uniforms," a trend that still continues 20 years later. That's not Carlton Fisk, that's Bill Clinton.